Wednesday, April 19, 1837.Springfield, IL. Lincoln writes Levi Davis, auditor, introducing Dr. Anson G. Henry who visits Vandalia to draw money to enable commissioners to commence state house in Springfield. 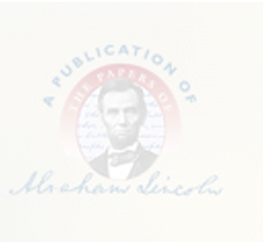 Lincoln concludes: "We have, generally in this country, peace, health, and plenty, and no news. "Abraham Lincoln to Levi Davis, 19 April 1837, CW, 1:77-78.